The interpretive trail, Visitor Center and exhibits, amphitheater, and trail to the fishing pier are wheelchair accessible. The Creekfield Lake Nature Trail is fully paved and takes you on a .5-mile loop of an outstanding wetland area. Look for a series of panels with tactile bronzes of wetland wildlife along the trail. The trail also has an accessible boardwalk and observation deck and rest areas with shaded benches. Check out an audio-described tour at park headquarters. The "Habitats and Niches" exhibit includes an unusual "hands-on" alligator discovery area, a tactile model of the park, and an open-captioned orientation video. The group pavilions in the Elm Lake and Hale Lake areas have paved wheelchair access from the parking areas. 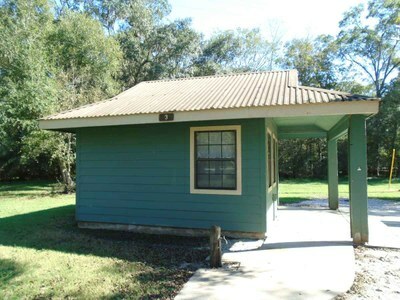 The cabin has a paved pathway from the parking area. Its outside picnic table is designed for a wheelchair to access. 201, 203, 231, 233, 234, in Red Buckeye Camping Area. Screened Shelters 1 and 13 have picnic tables for wheelchair users, and a cement trail from the parking area to the front of the cabin and near the fire ring.